Myst was originally released in 1993. and soon became a huge hit with critics and gamers alike. Up until 2002 the puzzle-based adventure game held the record for the best-selling PC game of all time; today, it’s still ranked among the classics. Mental Energy: The graphics in Myst look spectacular in the iPhone version of the adventure game which, like its desktop predecessor, puts a premium on logic and puzzle-solving. Now the venerable game from Cyan Worlds is back, just a touch away in the form of Myst for the IPhone and IPod touch. Those who remember playing Myst on their desktops are in for a nostalgic trip back to the game’s haunting and mysterious world. If you’ve never played Myst before, you’ll find it unlike any other game, complete with mystery, puzzles, a rich backstory, and immersive graphics and music. Myst is a first-person adventure through a beautiful and highly engaging world. When you start the $6 game, you’ll find yourself on a seemingly deserted island without any backstory or specified goals. It’s up to you to explore and find clues to what’s going on. Traveling around this interactive world, you’ll find many items and puzzles that will reveal more of the story and even transport you to other ages to continue your quest. As you explore and uncover secrets of the island’s history, you soon find yourself fully engrossed in the plot. Within the realm of Myst, you are presented with decisions which will affect the game’s ending. Different choices will produce different outcomes, which makes the game extremely replayable. You travel through the world of Myst by tapping on a location in the distance; the onscreen picture cross-fades into an image of your destination. 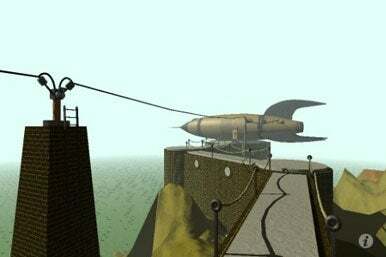 Myst features very little animation, with most of it consisting of levers to pull or objects to move. The game’s graphics are really beautiful, prompting you to see what’s around the next corner, while the music and sounds help to fully immerse you into a new and intriguing world. At any time you can save your current spot in the game by dragging and dropping it into one of four empty bookmark slots. Myst is not a fast-paced action game, and there are no physical enemies to fight or chances of dying. Instead, it is a relaxing-yet-challenging game of discovery, exploration, and logical thinking. If you like playing at your own speed while solving puzzles and riddles, then you’re sure to enjoy Myst. On the other hand, if you have a touch of ADD or just prefer fast-paced action, this may not be the game for you. Overall, this port of Myst to the iPhone and iPod touch has remained extremely faithful to the original game—it looks even better than you may remember due to the iPhone’s high-resolution screen. Myst is a rather large download of 727 MB and you’ll actually need 1.5GB of free space to install it. Considering the many hours of intriguing play and the depth of its story line, Myst should be a welcome addition to your iPhone or iPod touch. Myst runs on any iPhone or iPod touch running the iPhone 2.2.1 software update.